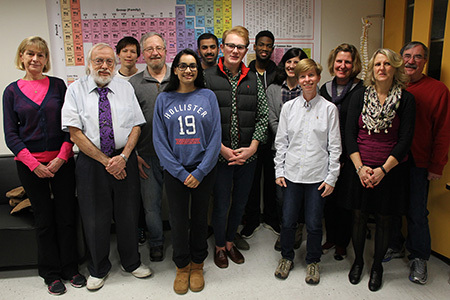 National Chemistry Week volunteers, from left, faculty members Helen Tanzini (Chemistry) and Carlo Alfare (Chemistry), student Ray Miller, Bill Ehrhardt, a retired chemist and member of the American Chemical Society, students Rabiah Asif, Dowd Naik, Samuel Zdanowicz, Cedric Lary, Christina Konstantis and Kate Kingsley; and faculty members Linda Falkow (Biology), Ellen Genovesi (Biology) and Ralph Popp (Physics). Not pictured: Diane Hilker, Lisa Dunn, Jingrong Huang, Ron Russell, Thom Caggiano and Alex Grushow. According to MCCC Professor of Chemistry Helen Tanzini, who coordinates the outreach program, “Our goal is to excite youngsters about the joys of chemistry and the mysteries of chemical processes – and, while we’re at it, create enthusiasm in the next generation about science and science careers.” This year, the weeklong observance was held from October 16 to 22. Since its start, MCCC’s National Chemistry Week project has served approximately 12,000 students in 500 classes in 41 different schools. (Some schools have been visited multiple times.) All funding for materials comes from the Trenton Section of the American Chemical Society. Tanzini stresses that not only is the program beneficial for the children, but also for the 30-plus college students who get the opportunity to play a leadership role as they teach and give back to their community. Students studying chemistry, biology, nursing and education have all participated, with numerous alumni returning to Mercer to volunteer. Those who are not available for the daytime trips pitch in by helping to prep and break down the equipment and materials, a big behind-the-scenes assignment that is essential to the volunteers' work. This year, the students presented six experiments (with one in reserve if time allowed). All the volunteers concurred that the making of “slime” continues to be the show-stopper. A concoction of PVA and borax made in advance by students from Rider is mixed with glitter. The solution mimics the function of mucus found naturally in the body; each child is given his/her own cup to stir up and keep as a souvenir. “The children get such a kick out of making their own slime that they can take home and show their families. And, it reinforces the message that chemistry is a fun and wondrous thing,” Tanzini said. Among the other experiments were an “energy stick,” which uses long-lasting LED lights to teach about conductors of electricity; the use of Milk of Magnesia to present a colorful demonstration of acid/base neutralization; and the making of artificial snow by using a superabsorbent polymer powder that absorbs water and becomes fluffy. A hearty endorsement of the program came from Beth Caufield, a teacher at Greenwood Elementary School in Hamilton, where eight classes enjoyed MCCC's chemistry show. “The presentations were fabulous. The students and teachers loved participating in your exciting and fun hands-on activities. Greenwood now has lots of future scientists who may grow up to give NCW presentations when they become college students!"